The Barnard College archivists have recently finished inventorying the Lucyle Hook Collection, 13 boxes of personal documents and photographs that tell the story of Mrs. Hook’s life. The collection is so personal that I had to continually stop myself from referring to her as “Lucyle” in this post. Lucyle Hook, a Texan belle with a taste for travel, was one of Barnard’s most distinguished and interesting faculty members. Hook was appointed as Professor Emeritus of English at Barnard on July 1st, 1967 after 21 years of service at the school. She specialized in seventeenth century literature and drama, and was ever departing for Greece or London on research trips. Her personal notebooks, left to the Barnard College Archives, filled with edits and additions, are clearly the work of a woman with a tireless and engaged mind. Hook was born in Quanah, TX, on October 29th, 1901, where she grew up reading the “six-foot-shelf of books” which sparked her lifelong interest in exploring literature, drama, and the English language. She came to Barnard after a stint of teaching high school in Scarsdale. She didn’t intend to stay. Hook was on a one year visiting professorship, filling in for Barnard legend and drama professor Minor Latham. After spending a year at Barnard, however, she deferred her plans to leave–Barnard felt right. Much of her past was intertwined with the Barnard/Columbia microcosm. Hook had received her masters degree at Columbia, and her husband, Fred Rother had taught there. Furthermore, Barnard was flexible enough to permit her travels and breaks for research. The English department became her home until retirement. During a trip to Turkey, she was made the head of the American College for Girls in Istanbul by Dean Gildersleeve, who was a trustee for the school. She took a three year leave of absence from Barnard. During her time in Turkey, she traveled throughout the Middle East and Africa, keeping detailed journals in which she drew parallels between Marrakesh markets and her the Bartholomew Fair of her beloved Jonsonian drama. Hook’s life was especially well visually documented at this time. Photographs show her standing on the wing of a bi-plane, replete with large sunglasses, red lipstick, and a head scarf; in the desert with a Camel; and on a safari, watching a lion devour a gnu. After her retirement from Barnard, Hook spent most of her time either in England or continuing her treks across the globe. Barnard students today remember and thank Lucyle Hook for the endowment made in her name–the Lucyle Hook Travel Fund, for those students whose research calls for as many adventures as hers did–and for her early publication “the Research Paper,” which can considerably shorten the long, desperate hours spent in Butler and Lehman. 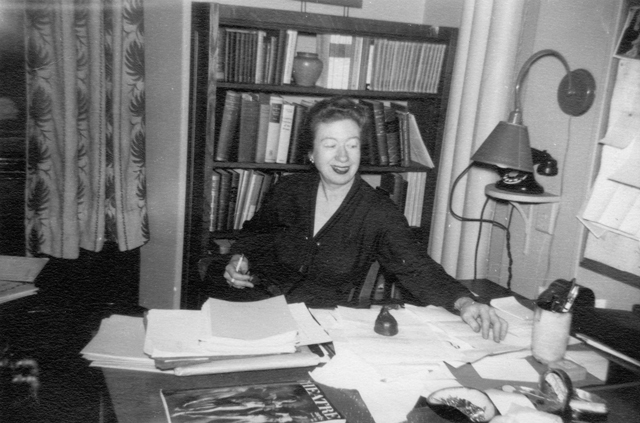 Lucyle Hook at her desk in Barnard College. Image courtesy of Barnard College Archives. The Barnard College Archives staff, fellows, and student workers maintain this blog as a means to highlight collections and share findings in the Archives. For detailed information on our holdings please visit our website at archives.barnard.edu.